The European Union approved to finance with 10 million euros the ECO-GATE project directed and coordinated by NEDGIA NATURGY GROUP, as the leader of a consortium made up of natural gas operators, technology and service providers, end users and experts in market knowledge and promotion of Spain, Portugal, France and Germany. 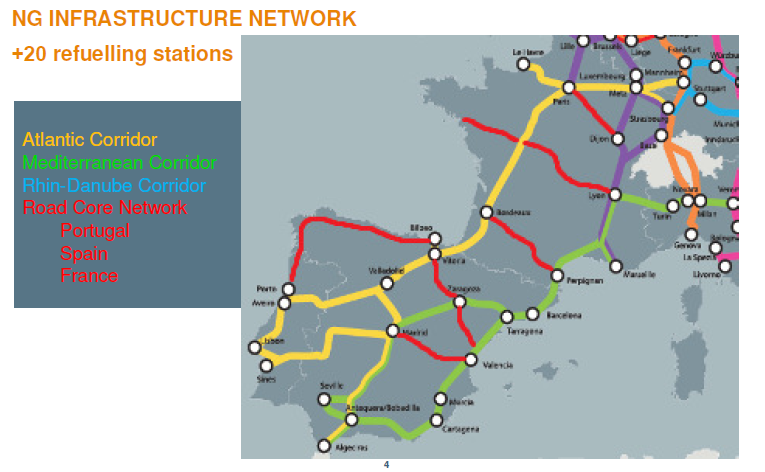 The project will involve the construction of more than 20 gas stations in the Atlantic and Mediterranean corridors of the road network in Spain, France, Germany and Portugal. The European Commission has approved to finance with 10 million euros the development of the European ECO-GATE project, a global action plan for the development of mobility with CNG (compressed natural gas) and LNG (liquid natural gas) in Europe, leaded by Nedgia Naturgy Group through the distributor Gas Natural Madrid, which is in charge of directing and coordinating the project. ECO-GATE is the acronym for European COrridors for natural GAs Transport Efficiency. The Grant Agreement has been registered with number INEA/CEF/TRAN/M2016/1359344. The more than 20 gas stations contemplated, will be located in each of the 4 countries where the project is deployed: Germany, France, Portugal and Spain, and the funds will be distributed among the four countries. Spain will receive financing to develop gas stations in Barcelona, Burgos, Madrid, Murcia, Salamanca, Irún, Tordesillas, La Junquera, Córdoba and Cartagena, among other cities. The European ECO-GATE project is one of the most ambitious in the vehicular market of conventional and renewable natural gas with the deployment of infrastructure along the Atlantic Corridor and the Mediterranean Corridor through new technologies and innovative solutions. ECO-GATE will facilitate a rapid and massive deployment of this alternative fuel, thanks to a significant reduction of the unit cost and to a better understanding and greater knowledge of the needs of the customers. The financing of the European Union responds to the fact that the project contributes enormously to compliance with the European Directive 94/2014 and to the development of the natural gas market for mobility as an alternative fuel. 1.- Demand Analyser Management System: platform aimed at gas stations managers to assist them in their decision making optimising product stock levels. Using historic demand data and other contextual information, the platform will determine foreseen needs and analyse in detail the network demands. 2.- Asset Management Platform: software solution to plan in advance and monitor assets maintenance tasks in an infrastructure or industrial process, based on criticality. The system is fully focused in assets management providing the tools and a mature methodology customised for CNG/LNG stations, also complying recent norm ISO55000.